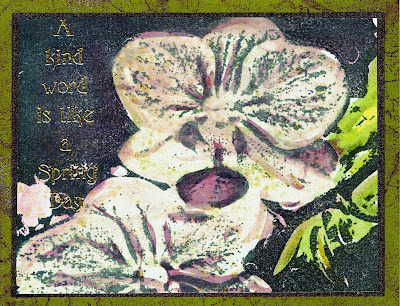 To create this card I used two different Technique stamps and my Pan Pastels. I used Veined Marble - http://techniquejunkies.com/veined-marble/, and Better With Friends - http://techniquejunkies.com/better-with-friends/. If you look at the Veined Marble stamp, you can easily that the lines and veins are not evenly distributed through the stamp. That very fact gave me an idea. I first stamped my marble stamp with the dirty Versamark on white card stock. I then applied a peachy color of Pan Pastel. Then I reinked the stamp with the dirty Versamark and twisted the stamp so the image was stamped in the opposite direction of the first stamping. This caused the "veins" of the marble to be in different places. I covered that inking with a rose Pan Pastel. Next I reinked the stamp with the dirty Versamark pad. This time I bent the stamp and stamped in a variety of places over the previously stamped images. Now I used a burgundy Pan Pastel. Then I sprayed it with an artist fixative. I used a fixative I bought years ago and it has very little smell. I have used it for a long time but now I think I need a new can, This process added depth to the Veined Marble because you can see the various colors in layers -- just like with a real piece of marble. 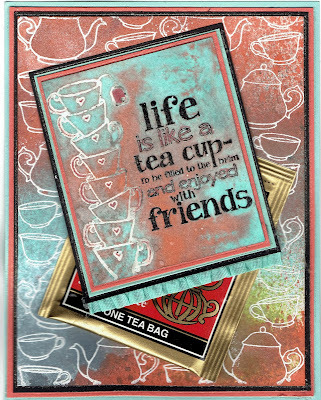 I used my "embossing buddy" over the surface and then stamped the focal image with Versafine black ink. It was covered with black embossing powder and heat set it. I used several layers of both card stock and designer paper. I used a twisted ribbon and some pearls as an embellishment. 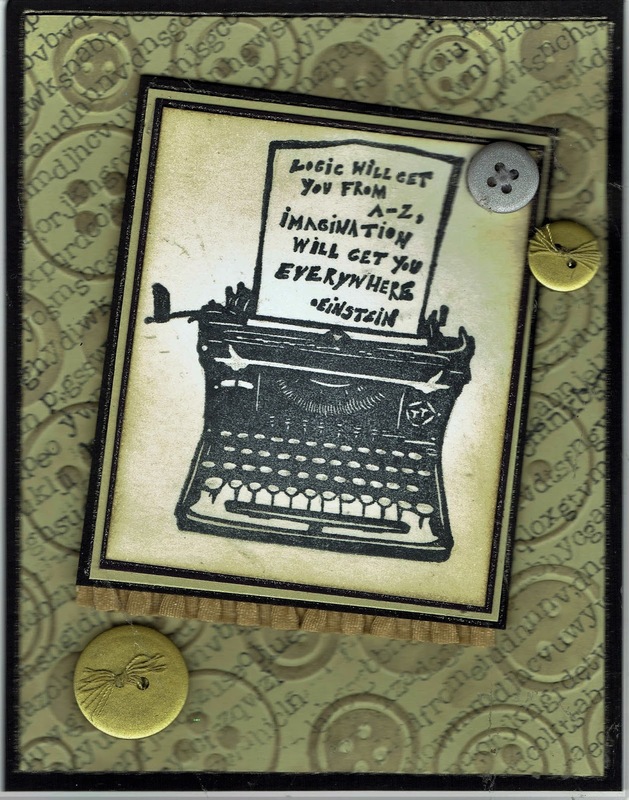 The next Blog Hop for the new January release stamps will be on Monday, January 2, 2017. Set your calendar to come along on out hop! Happy day after Christmas! Are you feeling the post Christmas lag? I am as I have had family for three different meals and three different sets of gift opening. It was all good, but all tiring. One adult son-in-law was ill so he and his family stayed home while the elderly relatives were here (age 89 and 90) so they would not get the virus. Then after the elderly folks went home, they came out and opened gifts. Now my daughter and kids are here for a couple of days. That will be fun. And in between gift openings I had the opportunity to craft a couple of cards. I will post one today and one on Wednesday. 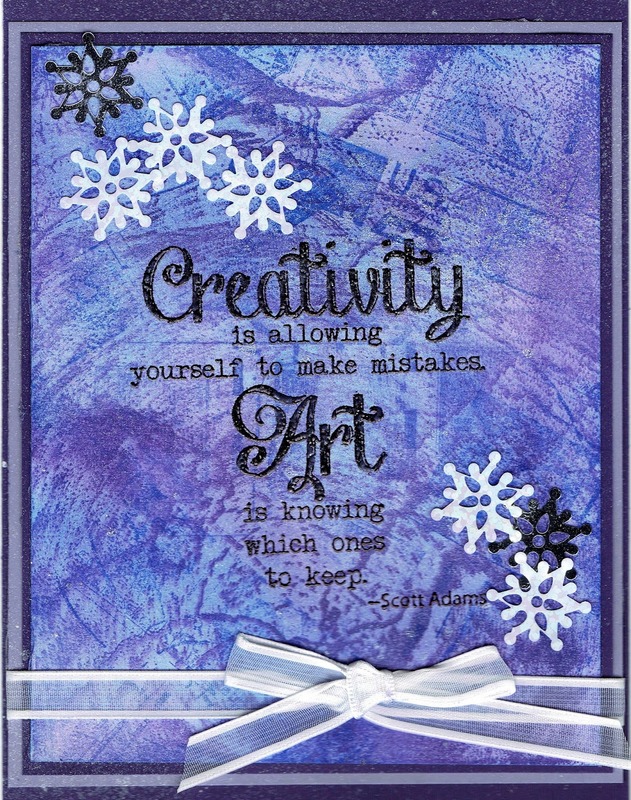 I used a variety of Technique Junkie stamps -- Veined Marble (http://techniquejunkies.com/veined-marble/), Return to Sender (http://techniquejunkies.com/return-to-sender/), and Art Mistakes (http://techniquejunkies.com/art-mistakes/). I also used a dirty Versamark pad and Pan Pastels. Pat Huntoon talked about this in her blog post on Friday - http://techniquejunkies.blogspot.com/2016/12/pan-pastel-backgrounds.html. The dirty Versamark ink pad helps you to see the image you have stamped much easier. Pan Pastels are unique in several factors. You can layer them and still see the individual colors as they are more transparent than other pastels. I have used both. The fact that these are more translucent adds to their uniqueness. Like nearly all kinds of pastels they are fragile and easily crack or break. However, unlike traditional artist grade pastels, these can be repaired. I was so impressed by the Pan Pastels that I bought a LOT of them at the York Heirloom stamp show in September. One of the deciding factors for me was how easy they can be repaired. I have a LOT of other artist pastels in my craft room. I used artist pastels in high school in art classes. They are easy to blend with. But we did not have Versamark ink for the pastels to adhere to in those dark ages so long ago. Now for my card. I first stamped the Veined Marble stamp on white card stock. I used a sponge and a purple Pan Pastel and rubbed the pastels over the stamped image. Then I just sort of heat set the ink with the pastels. I don't think it is necessary but since I knew I was going to stamp an image to heat emboss I wanted to be sure I didn't have embossing powder sticking to the Versamark ink under the pastel powder. Then I inked up the Return to Sender stamp without it being on an acrylic block. That way I could bed the stamp and apply the ink in sections which is what I did. I continued this process all over the card stock. I applied a deep blue Pan Pastel over the purple. And I heat set it again. My final stamping was with the Art Mistakes stamp. I used Versafine Black ink and a detailed black embossing powder and heat set the powder. I sprayed some pearlized glimmer spray over the final card. The focal image was trimmed and layered with two different shades of purple card stock. The ribbon was added before adhering to the base card stock. A few Mylar snowflakes were glued down with liquid glue. 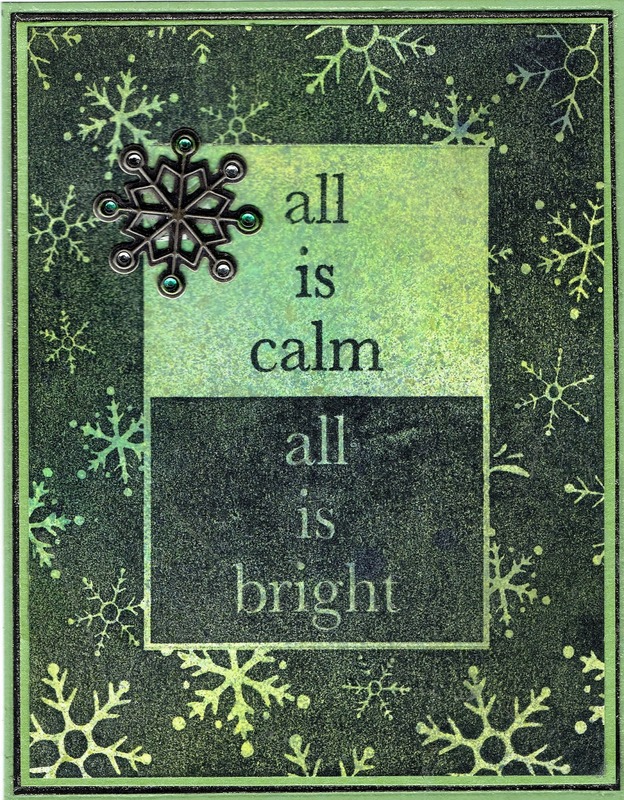 So now, I am curious did you get any stamping stuff for Christmas? Now you may have some time to get inky! 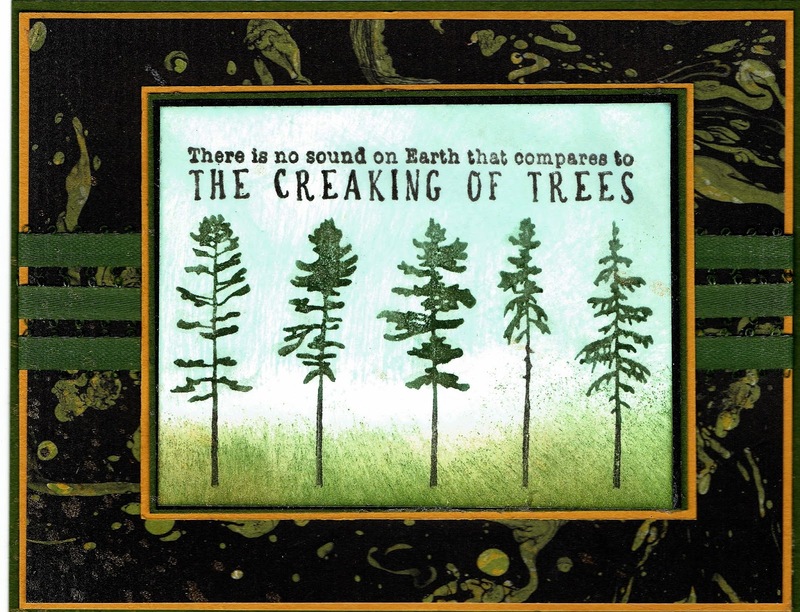 I used a Technique Junkie stamp Creaking Trees - http://techniquejunkies.com/creaking-trees/. I used a dark brown marker for the tree trunks and a deep olive marker for the pine needles. I "huffed" on the stamp to make sure the ink was moist and stamped it on the white stock. Then I used sponges to add the ground and sky. I spritzed the layers with gold glimmer spray. Three deep olive ribbon lengths wrap around a couple of layers, then adhered to the base card of deep olive. My next post will be the day after Christmas as there is too much to do between now and Christmas Day! Merry Christmas to all - and get inky! The 30 Days of Christmas is over and the Design Team is on to other types of stamps. Soon it will be time for a blog hop for the January re;lease! I used three Technique Junkie Stamps to create this card. I used Orchids - http://techniquejunkies.com/orchids/, A Kind Word - http://techniquejunkies.com/kind-word/, and Veined Marble - http://techniquejunkies.com/veined-marble/. I used a gray Memento ink to stamp the image on white card stock. I felt black ink might be too harsh. Then i used a vanilla pigment ink reinker, shook it up well, and squeezed a few drops on an acrylic block as my palette. I added a few drops of water to think the ink because regular pigment ink would be too opaque. I painted over the orchids and then heat set the ink until it was dry. After wiping off the acrylic block, I scribbled three different colors of regular dye ink: a dark yellow, some olive ink, and a razzelberry color. I used my water brush and added highlights or those colors on the leaves and the flowers. I heat set that as well. Then i squirted some gold glimmer spray over the orchid panel, and I heal set that. I trimmed the orchid panel and layered it on Star Dream metallic raspberry text weight card stock. Then I inked up the Veined Marble stamp with the razzelberry ink and curved the stamp to add texture around the edge of the green card stock of the base layer since there was a wider border than usual. I adhered the orchid panel to the base card. I used an embossing buddy to help prevent stray gold flecks of embossing powder on the dark area of the stamped and painted focal image. I used Versamark ink on the stamp die and stamped. Then I covered it with detail gold embossing powder and heat set. I wish it showed up clearer in the scan. But anytime you scan metallic embossed images you can have trouble getting them to show clearly. This would be a lovely Thank you card or a birthday card. This is the very last day of the 30 (or 31) Days of Christmas! And it is the last day to get 25% off every single one of the Technique Junkie Christmas stamps! Have you placed your order yet? I wish you see the shimmer of the red embossing tinsel for the center ornament! It is truly beautiful! The scan didn't do this justice, so then I took a picture of the card. I still had some difficulty because under the light I kept getting a shadow of my phone. In front of the window was a little difficult because it is very cloudy today. 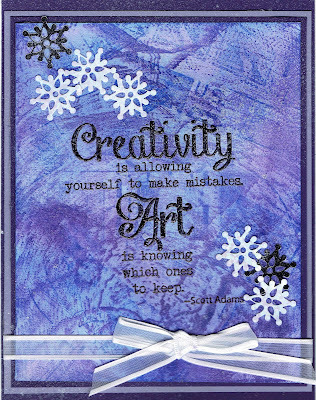 I used Technique Junkie Christmas Ornaments - http://techniquejunkies.com/christmas-ornaments-trio-set-of-9/ - to create this card. I used black stock and heat embossed the three ornaments in three different colors. To accomplish this I used my MISTI. I put the black card stock in the corner of the MISTI. Then I arranged the ornament stamps and closed the lid. 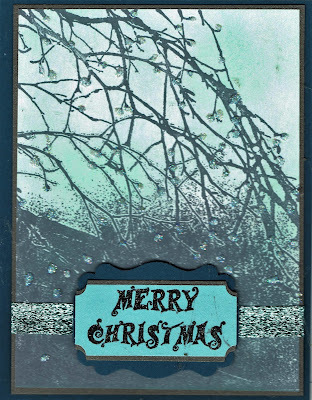 I used an embossing buddy over the black card stock - hence the powdery look. I inked up the stamp I embossed in gold first with Versamark ink. Then i closed the lid and pressed. I lifted the lid and could see not all of the stamp had the Versamark ink. So i repeated the process. With the MISTI the stamp was exactly where it was before so no smudging. I heat embossed with detail gold powder. I removed that stamp from the MISTI lid so no more ink would be transferred and therefore cause a different color of embossing powder to stick where I didn't want it. I repeated those steps with the silver detail powder, and then the red tinsel embossing powder. 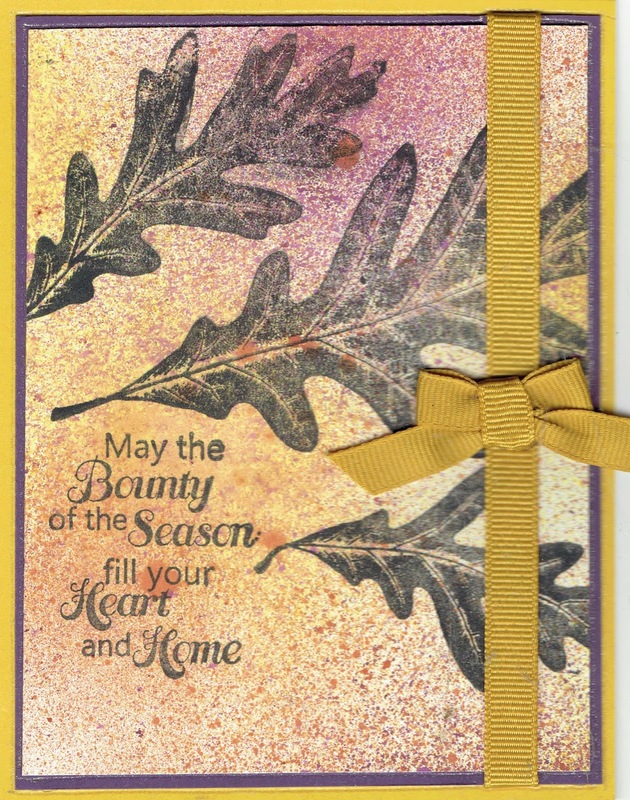 I stamped the greeting on a scrap of black card stock and heat embossed with detail gold embossing powder. It was punch out of the black. I punched out two red pieces and trimmed them so they would fit behind the greeting. The black card stock was layered on gold text weight paper, which was layered on red car stock. 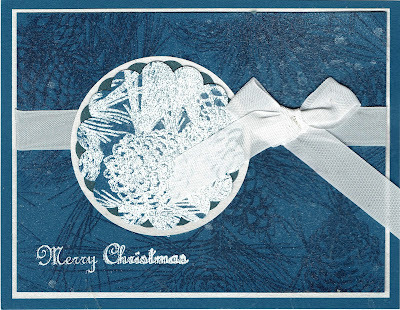 I have enlarged this card so you can see more of the detail. 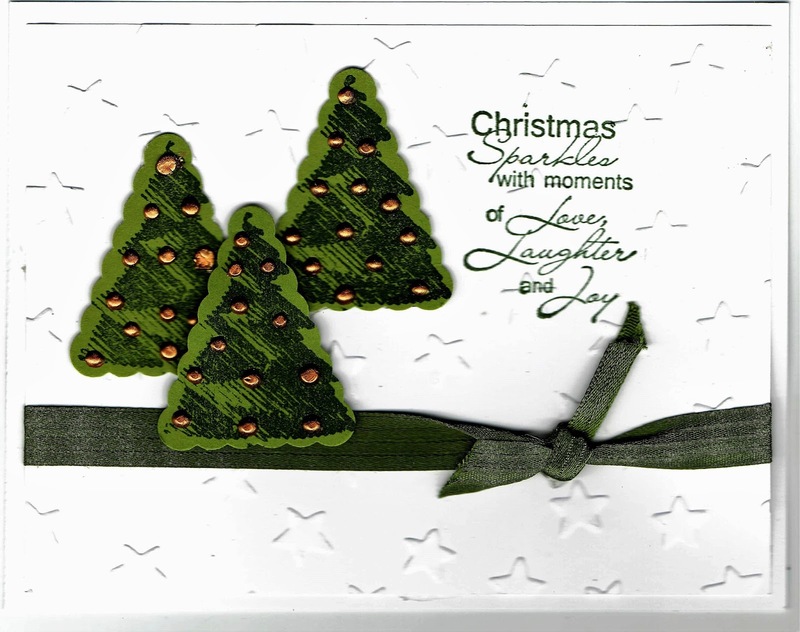 I used one of the six trees in the Technique Jiunkie stamp set - Christmas Trees - http://techniquejunkies.com/christmas-trees-set-of-6/. I used the greeting from the Technique Junkie stamp set Christmas Ornaments - http://techniquejunkies.com/christmas-ornaments-trio-set-of-9/. I used olive card stock and meadow for the trees. I used a scallop punch to cut them out. I stamped the greeting in the upper right corner of white card stock. Then I used that same card stock in an embossing folder with stars. I wrapped dark green ribbon around the card stock layer and tieed a knot. I used NUVO drops to create the ornaments on the trees. While it dries quickly The dots can smooch. down even though they are dry. Therefore I used tiny glue dots to adhere the trees to the card stock below the trees. The NUVO drops are fun as they are self leveling with no little points. So you squeeze a drop down on the card stock and they self level and dry within a few minutes! 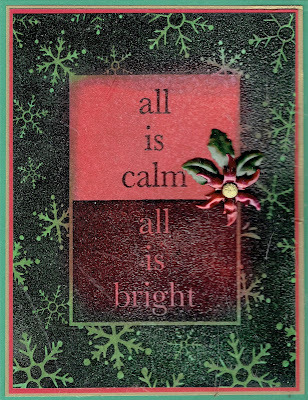 Another fairly simple card with a wow factor Good for this time of the year. Don't for get there is only one more day get 25% off every single Technique Junkie Christmas stamp! Have a great day -- and get inky! Day 29 of 30 Days of Christmas! Stars are often associated with Christmas. The focal image is not a new Technique Junkie stamp but it created a lovely card that was quite simple to make and would be a good card for mass production. Because there are no "bumps or lumps" it would require no extra postage. And that is something to think about when making Christmas cards. I decided to use navy and silver as my card colors. Very Christmasy! I used Technqiue Junkie stamps Star Stream - http://techniquejunkies.com/star-stream/, and Vintage Star - http://techniquejunkies.com/vintage-star/. Both stamps were inked with Versamark and then the images were heat embossed with detail silver em bossing powder. 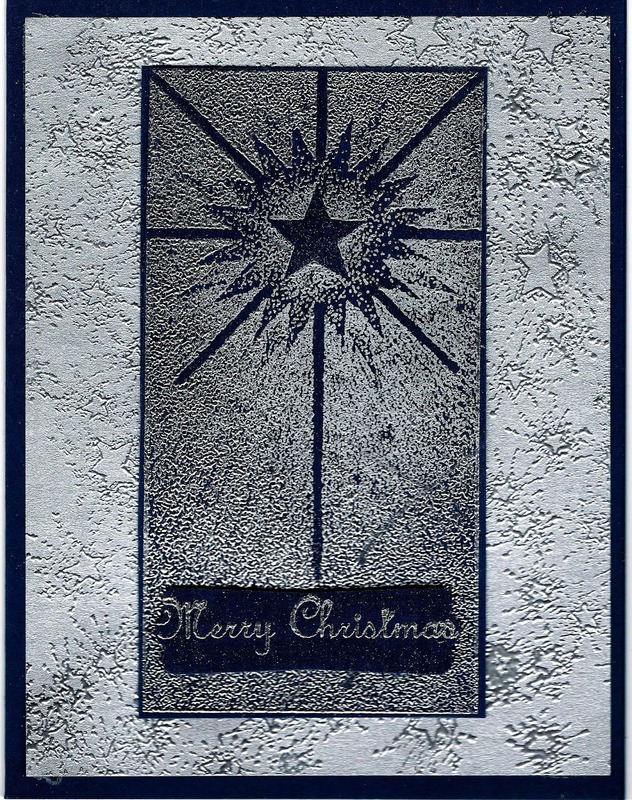 I trimmed the image of Vintage Star to leave a thin layer of navy card stock around the edge. The Star Stream stamp was silver text weight card stock. The Technique Junkie Merry Christmas was stamped with Versamark on navy card, heat embossed with silver detail powder, and punched out. 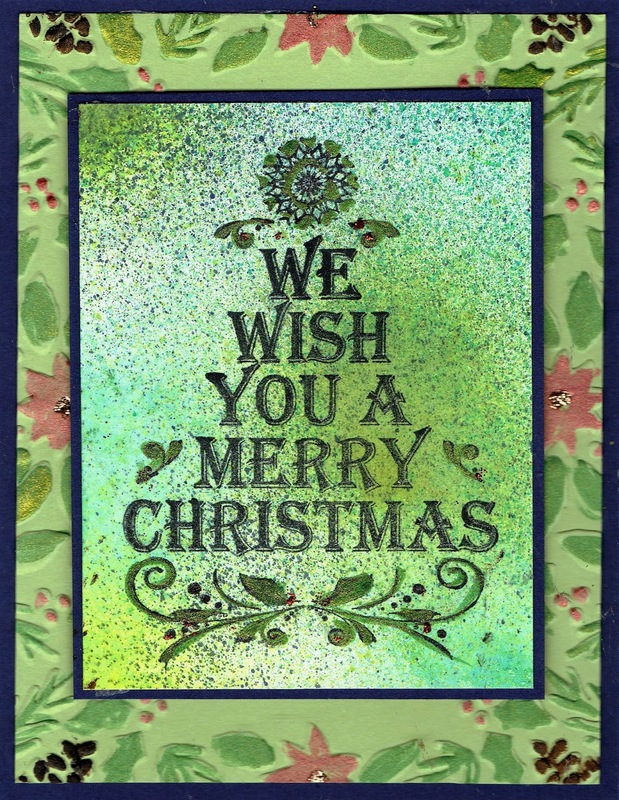 I used the clear Wink of Stella pen to add the shimmer on the card. Don't forget -- there are only 2 more days to get 25% off every single one of the Technique Junkie Christmas stamps! Have a great day -- and get inky! Day 28 of the 30 Days of Christmas! Wow, this time has gone by very fast! Of course that is often the way it is in December! I had "planned" to post and make more cards than I was able to do. 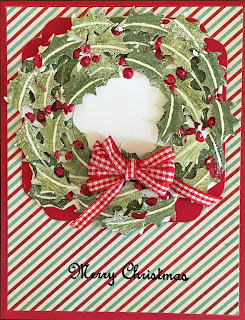 My reason is a simple one -- I just didn't have the time to make anymore cards than I made! Everyone ought to be able to understand that. They "whys" to explain my lack of time are too numerous to list but I am sure many of us have found that lack of time to be true for many things we want to do during the holiday seasons. So here is my card for today. 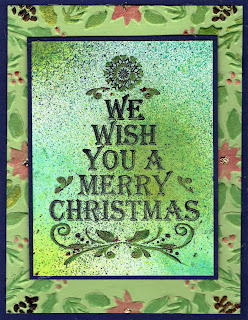 I will now have a Christmas card on this personal blog for the next three days. I spent time tonight making these cards. I used some die cuts i purchased years ago. This is the first time I have used them. 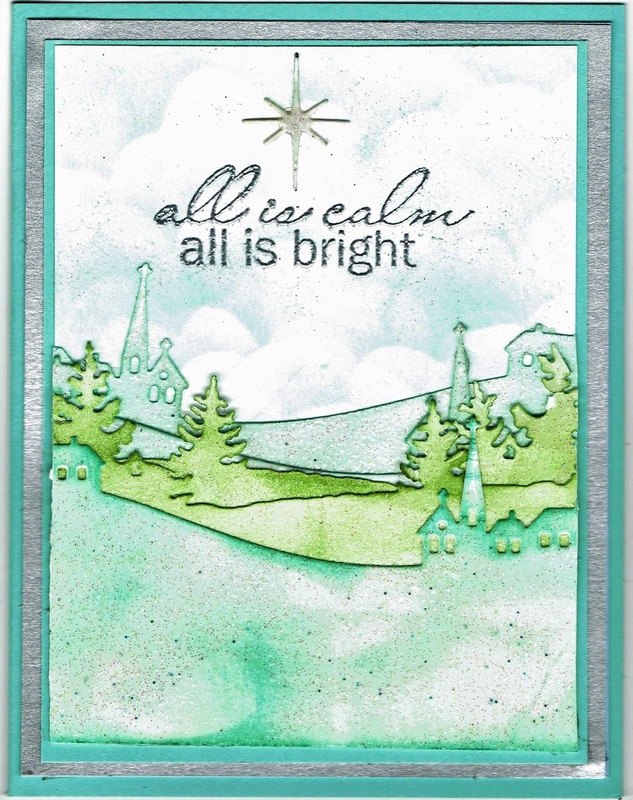 I used a Technique Junkie stamp - All is Calm - http://techniquejunkies.com/all-is-calm/. I cut several strips of white card stock or the trees die and the houses and church die. I sponged the tree strips with green ink. It didn't matter to me if the sponging was really even because I felt it added texture. 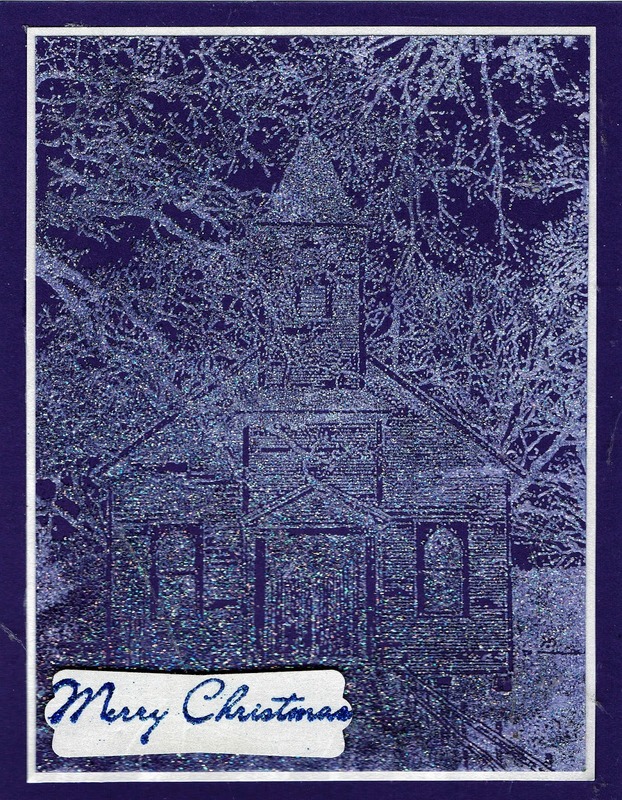 I sponged the houses and church strips with a matching blue of the card stock for the base card. 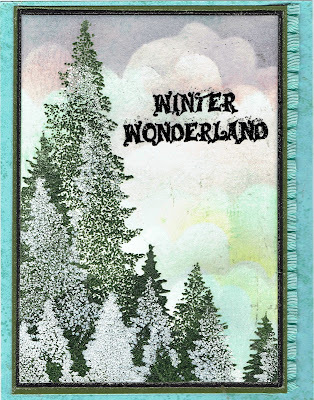 I covered each strip with Versamark ink, cover it with a "snowy" embossing powder and heat set. All those strips really glisten! It was not an iridescent powder. 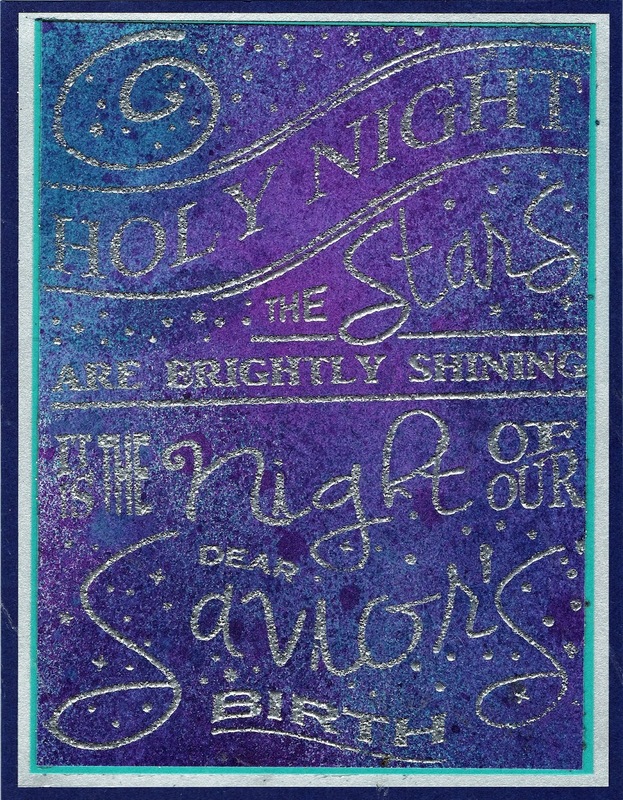 Then I stamped the greeting at the top (allowing room for the "star.") with Versamark ink, and heat embossed with detail silver embossing powder. I used my ATG tape runner to to adhere the strips together in an eye pleasing arrangement to me. I then ran all of the strips adhered together through my Xyron machine to get adhesive on the back side. 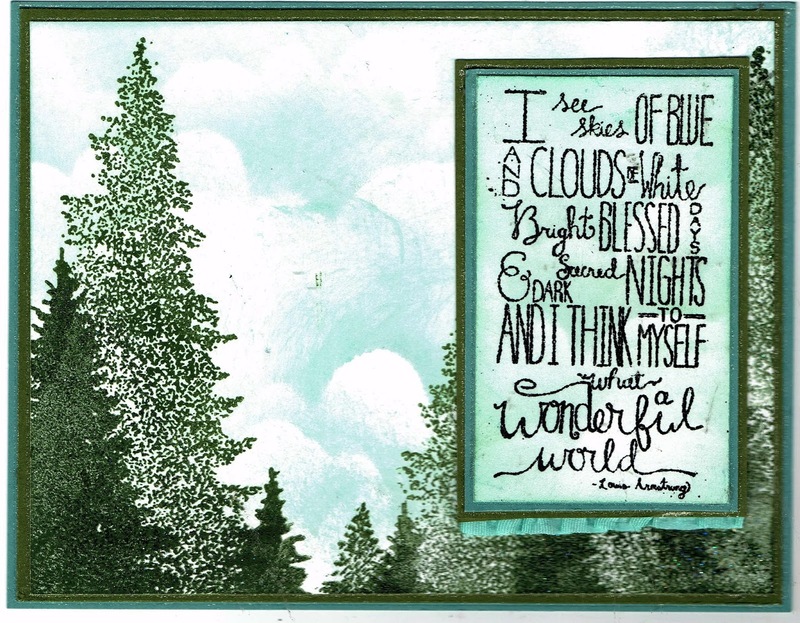 I used my home made cloud stencil to add color and visual texture to the sky. Then I adhered the panel of trees and houses, etc to the sponged cloud panel. 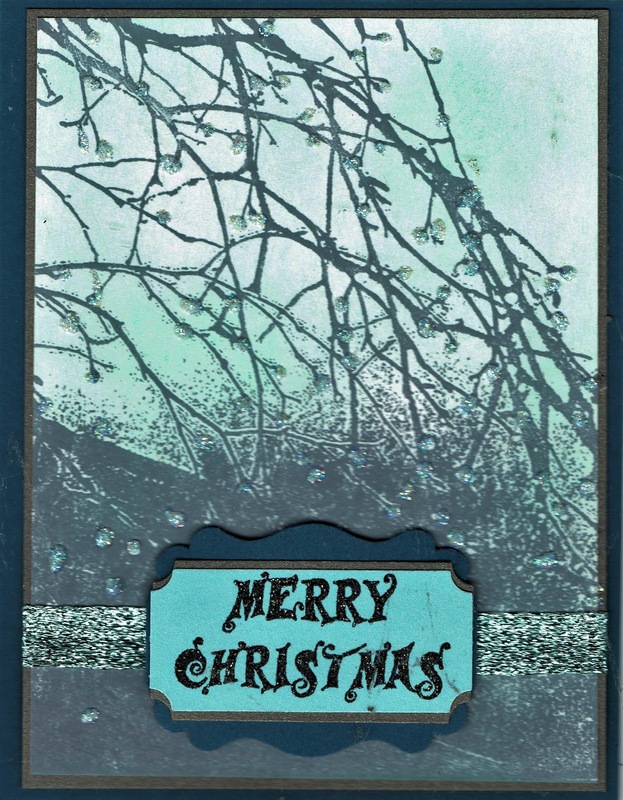 This was layered on blue and layered on silver, and onto the base card. While this card is not difficult, it was a little "fussy" and time consuming, but i felt it was worth the effort. I still have a few cards to make, and some to hand deliver, but most of my cards are in the mail. Some have received because they told me so. I hope you have a great day -- and get inky! Day 22 of 30 Days of Christmas! There is little about card making (no matter what stamps you are using) that is truly original. We get ideas all the time from other stampers, from magazines, from nature, from bill boards, from furniture -- just all sorts of places. So this card is totally different from a card by another stamper. You know what is the same? I used an angel and a bow. That is it! So now let me tell you what I did. 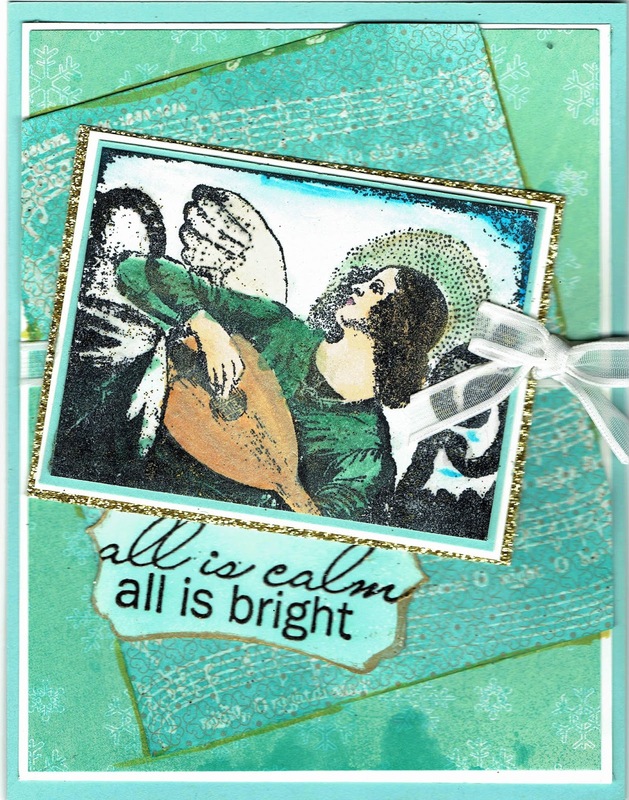 I had started coloring this stamped Technique Junkie Angel with Lute - http://techniquejunkies.com/angel-with-lute/, but I hadn't finished it, So I finished coloring with Smooch paints. Then I remembered I had purchased a new really glittery gold Smooch Paint at a recent stamp show. I used it on several places on this card. I tried to tip the card and take a picture of this glittery gold Smooch paint. I hope you can see it now. 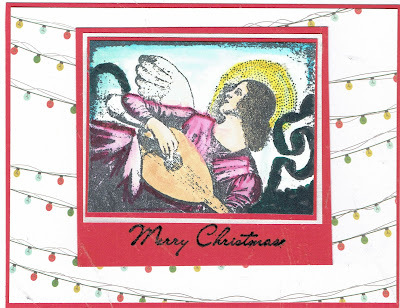 I used gold glitter paper behind the white layer on which the angel is adhered. 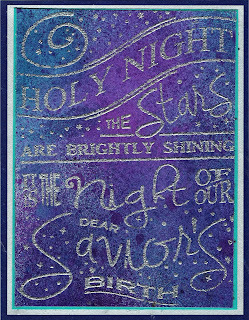 I took a very muted piece of designer paper and stamped the Technique Junkie stamp O Holy Night - http://techniquejunkies.com/o-holy-night/ - with Versamark ink and then heat embossed it with clear embossing powder. 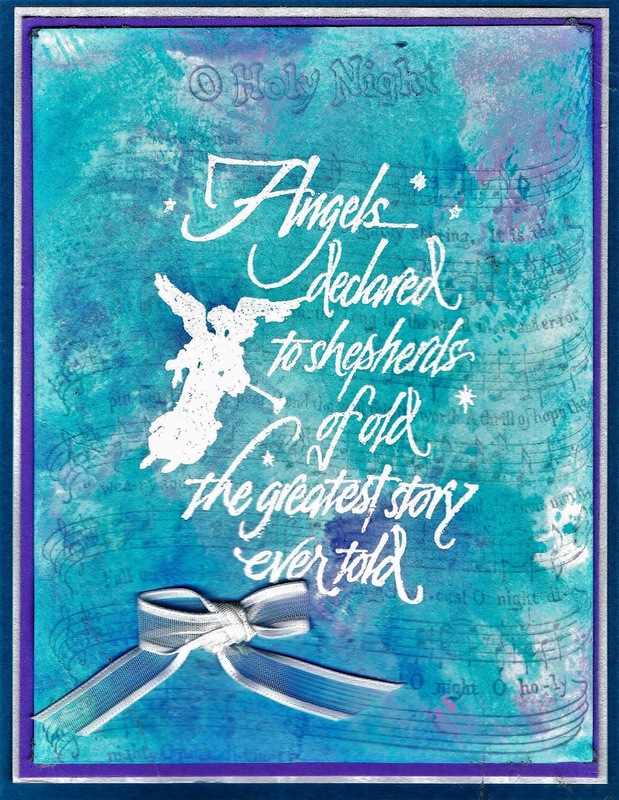 I used some Distress ink and went over the embossed image, and used an Art Anthology Colorations spray over the embossed image and wiped off excess ink so the music score and words show up. The music layer was adhered at an angle over a different sheet of designer paper that had some white snowflakes on the paper. I spritzed again with the Art Anthology Colorations spray and quickly wiped off the ink so it wouldn't be as dark. 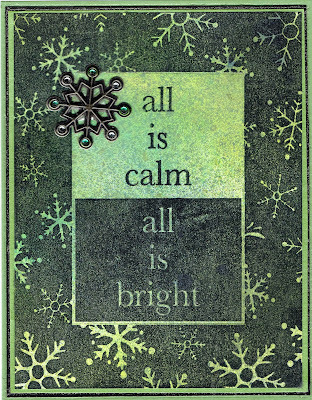 I stamped the greeting Technique - Junkie Stamp All is Calm - http://techniquejunkies.com/all-is-calm/ - with Versafine Black ink and used clear embossing powder when I heat embossed the words. I punched out the greeting and went around the edge with a gold Krylon pen. So pretty! Ribbon was wrapped around these layers before being adhered to the base layer. The angel and the greeting was adhered at an angle on the music layer. With a light touch I went around the edge of the embossed music paper with a gold Wink Of Stella marker. I used a fork bow as the final embellishment. Enjoy! Have a great day and get inky! I used the Technique Junkies Christmas Sponge set - http://techniquejunkies.com/christmas-sponge-set/ to create this wreath. I used two different green markers and a red marker to color the leaves and holly berries. 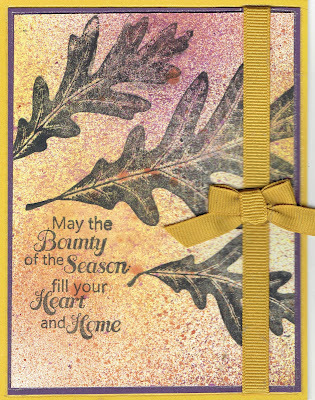 I stamped the holly on strips of white card stock and used a very similar curved holly punch and punched out the leaves. Cut a larger circle for the base of the wreath. I didn't do this and I should have as it would have made it much easier. I traced around a round bottle for the shape of the wreath. I adhered holly leaves down with a tape runner for the first layer. Then I used foam tape in thin strips curved under the leaves. I cut an interesting shape from red card stock to lay the wreath on and adhered it. I used Liquid Pearls in a lovely red color for the berries - both where they were stamped and in other places as I thought they needed to be in place. I let it dry over night. A multi loop wreath (with my "Bow Easy") was adhered with a glue dot. The wreath panel was adhered to a layer of background paper which was adhered to the base layer of red card stock. 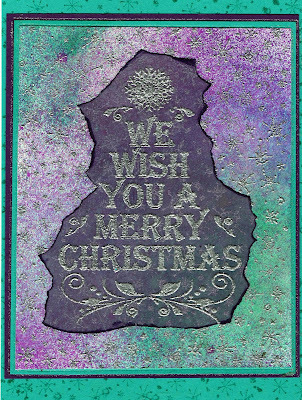 I stamped the Technique Junkies Merry Christmas - http://techniquejunkies.com/merry-christmas-2/ - with black Versafine ink and heat embossed it. Come back tomorrow for the November first Technique Junkies blog hop! Lots of terrific new stamps ahead! Happy day to you and get inky! Every one of us is aware that sometimes Life takes a turn and you do not expect it. That has happened to me this week. I ordered new laminate flooring for my stamp room and my bedroom this past Tuesday. Yesterday (only 2 days later!) they called me to tell me they could begin ripping up the old carpet and putting down the new flooring on Monday -- less than a week from when I paid the deposit. I thought I would have at least 2-3 weeks before this would happen. I had hoped it would be done by Thanksgiving not in less than a week! I was shocked to say the least. So I am working at emptying those two rooms so this can be done. I have to work when I can have the help to move the big stuff -- and that is today. This is the stuff off of my stamp desk and my my counter in my stamp room. I have moved a lot out of there and it is stacked here and there all over my kitchen and dining area. I hope by Tuesday evening I will have it all back in place or at least so I can work in there. I do have a few cards ready to scan and my plan was to do that last night and make a post today. But alas, the best laid plans of mice and men sometimes go awry and that happened to me. I will get those cards scanned and posted soon but not today. So think of me today -- and please get inky! I won't be! PS. An Update - both my bedroom and my stamp room are as empty as we could make it.And my kitchen, dining room, and living room is crowded with other furniture and other stuff. I now have to live this way until sometime on Monday and/or Tuesday afternoon. Once a room has the new flooring then I can start putting things back in that particular room. I can hardly wait until things are back where they need to be. I used the traditional Spotlighting technique to create this Christmas card. 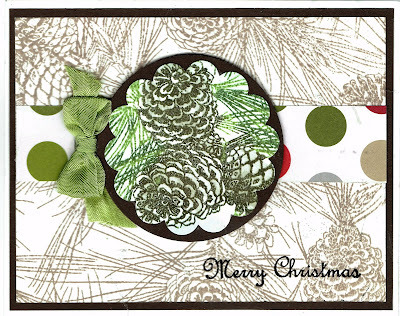 I used Technique Junkie stamp Pinecones - http://techniquejunkies.com/pinecones/ and TJ Merry Christmas . - http://techniquejunkies.com/merry-christmas-2/. I stamped the whole panel in a light tan/brown color. Then I colored the area I wanted to "spotlight" with markers. 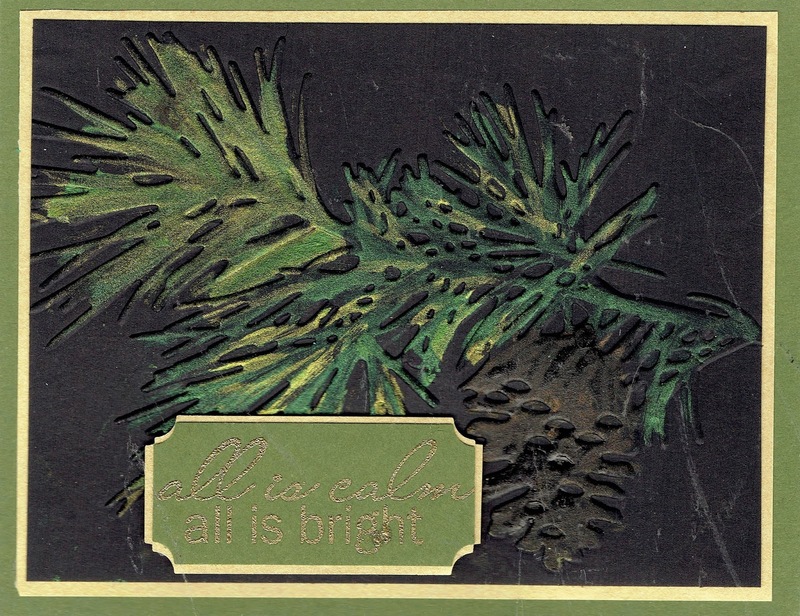 After stamping the image I punched out the pine cones and punched the dark brown circle. I added a piece of designer paper left over from another card and placed it so it would be behind the "Spotlight" of pine cones. 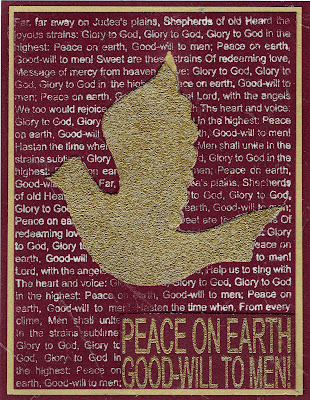 Merry Christmas was stamped and heat embossed so it would stand out and not be absorbed into the design behind it. I tied a "fork bow" using my Bow It All and adhered it to the left of the focal image. It was all layered on dark brown card stock. I have been so busy with other things after my daughter and her family moved to their own house, I have not had time to stamp. Tonight I tidied up in my stamp room actually found my stamping area! So what was a girl to do but STAMP! 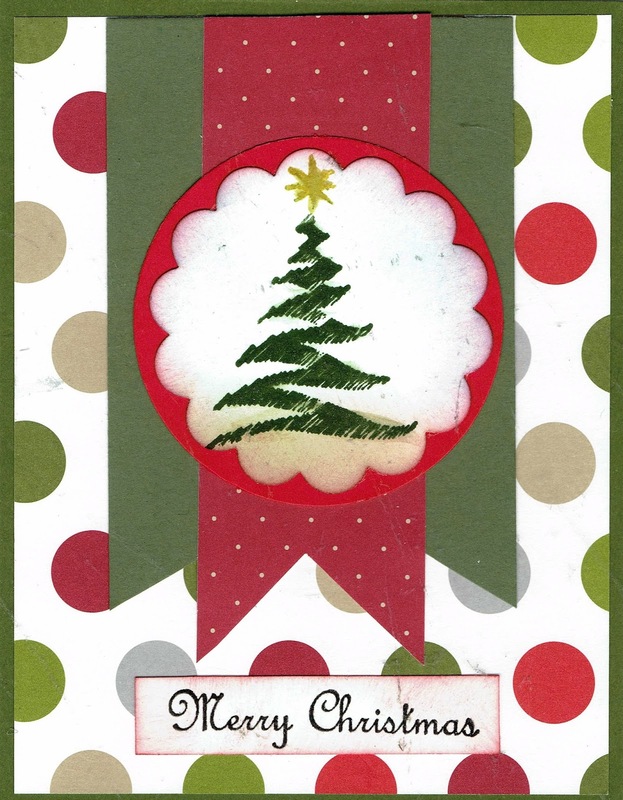 This card features Christmas sstamps from Technique Junkie Stamps. I used Christmas Trees, http://techniquejunkies.com/christmas-trees-set-of-6/. 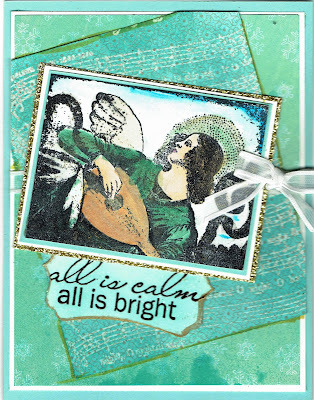 I also used Technique Junkie stamps Merry Christmas - http://techniquejunkies.com/merry-christmas-2/. This is a super easy and VERY reproducible card. I made an A2 size card which is 4 1/4 by 5 1/2 inches. I made 2 pennants out of designer paper. One pennant was large, and the other one was narrow. The tree was stamped on white card stock and then punched out with a 2 3/8 inch scallop punch. The red circle is 2 1/2 inches in diameter. I used Wink of Stella on the star and the branches. the greeting was stamped on a scrap piece of white card stock. It was stamped with Versafine ink and heat embossed. Sponging was added for dimension. As you can see this card involves layering but is quiet easy. Have a good day -- and get inky! Anyone who has followed my blog knows that my husband died 15 months ago. Our daughter, her hubby, and their 3 children (ages 3, 5, and 8) moved back here to live with me for the past 15 months. And while I love all of them and they love me, living together has not always been easy for any of us. We had many "learning" experiences and exercises in patience. I am happy to report they have purchased their own home and have moved in. They are now living 7 minutes away! - far enough so we not are not on each other's doorsteps, but close enough if I need help. So that is all good. And after they moved out, I needed to address the areas of the home where they basically lived. This will be a work in progress for a while yet. Any one who knows me, knows I am a long range planner, and I take advantage of sales and I try to shop wisely. Since I knew they were going to move, I started planning. I knew the color they had painted the room that was my daughter and her hubby's bedroom. Since that paint was only a year old, it did not need to be repainted. So I worked around that color. I bought new bedding, a new bed, a new mattress and box spring, 2 recliners at a garage sale that were still in pretty good shape, and a few other things. I have a large dining room table and I am not getting rid of it. But I felt I needed a new "space" for me to eat in the living room without having to eat sitting on the couch. So I shopped and shopped and looked for something to be a dining room for one. And this is the result. All of this means I haven't done much (read NOTHING) in the way of stamping, but I will be tomorrow. So I will have stamping to show on this blog very soon. So now I have a new beginning here -- living alone. So far it is good. The biggest difficulty will be to be sure I am not lonely. Being around people is good for all of us. So I have to plan my time so that I not alone all of the time. This is a quick and easy fall or Thanksgiving card. I sprayed white card stock with Art Anthology Colorations sprays. I stamped the Technique Junkie Vintage Botanical Oak - http://techniquejunkies.com/vintage-botanical-oak/ - with black Memento ink on the colorations sprays. I stamped the verse from the new September Release of Technique Junkie stamps called Thanksgiving Blessings - http://techniquejunkies.com/thanksgiving-blessings-set-of-5/. I used black memento ink for the verse. Layers and ribbons finish the card. Only 2 more days! Don't forget that all of the Technique Junkie Christmas release stamps are on sale for 15% off through October 10! Happy stamping and get get inky! 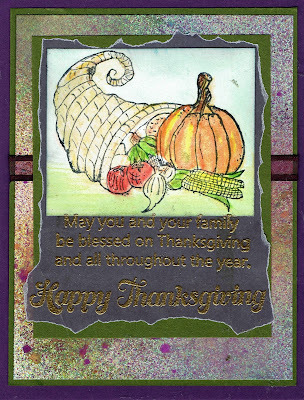 I used the newly released Technique Junkie Stamp set called Thanksgiving Blessings - http://techniquejunkies.com/thanksgiving-blessings-set-of-5/ to create this card. 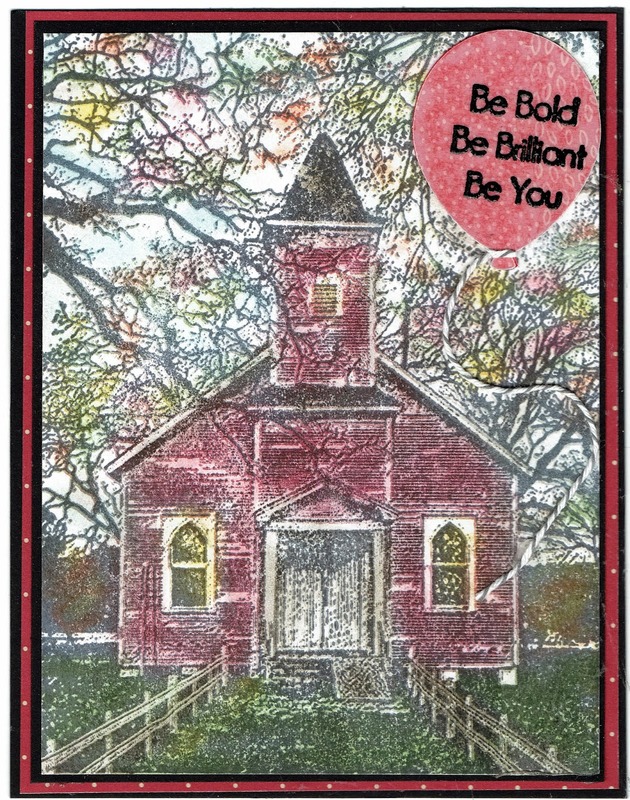 I used white card stock sprayed with Art Anthology Coloration sprays for the top layer of the base card. I stamped the Cornucopia image with black Memento ink. I used Prismacolor pencils and gamsol for coloring. I layered a purple vellum on the green card stock and placed the focal image on top. 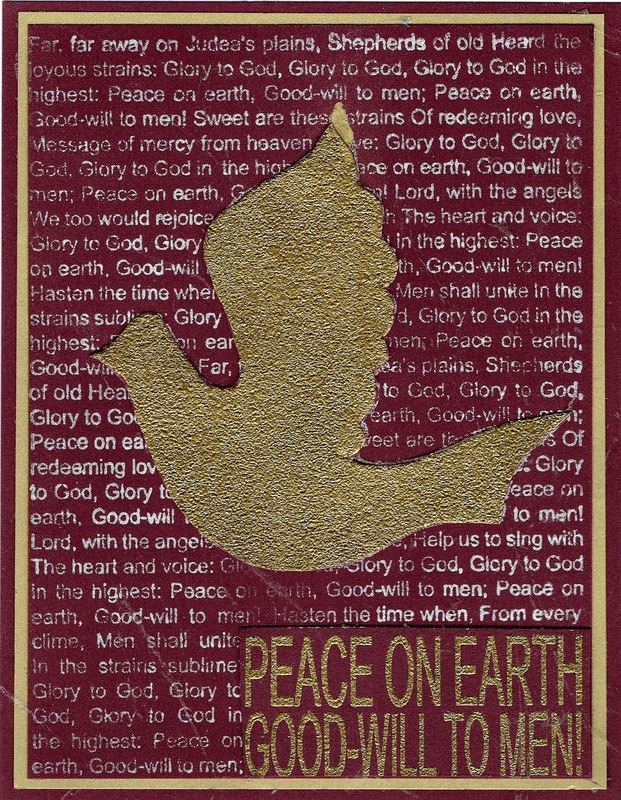 I stamped the verse and greeting on the lower half of the vellum, used detail gold embossing powder, and heat embossed. Layers and a purple ribbon finish the card. 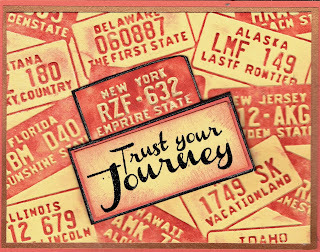 Have a great stamping day -- and get inky! I have been having fun with the Art Anthology Coloration sprays this month! They were sprayed on a white sheet of card stock. 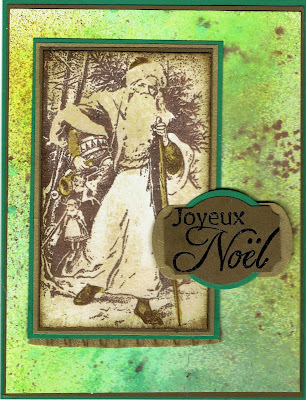 I used Technique Junkies Father Christmas - http://techniquejunkies.com/father-christmas/ - as my focal image and the newly released Technique Junkie stamp called Joyeux Noel - http://techniquejunkies.com/joyeux-noel/__. I stamped Father Christmas in a medium brown ink. 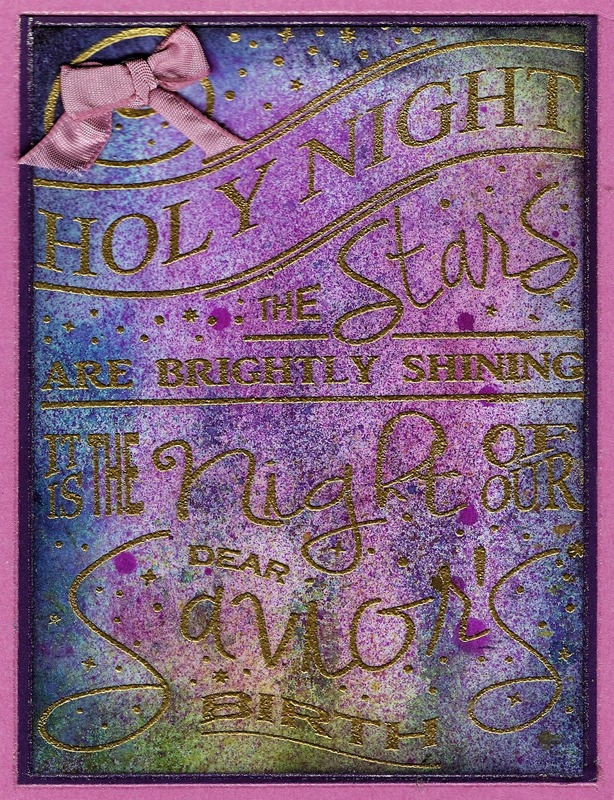 I used a gold Wink of Stella pen to highlight different areas in the stamped image. Lot of card stock layers - including a text weight gold card stock - and a ruffled ribbon at the bottom of Father Christmas help to make the card unique and rather simple to complete. I used three different punches for the embellishment. I first stamped the greeting with black Versafine ink, covered with detail black embossing powder, and heat set. Then i punched out the saying making sure I had most of the image. 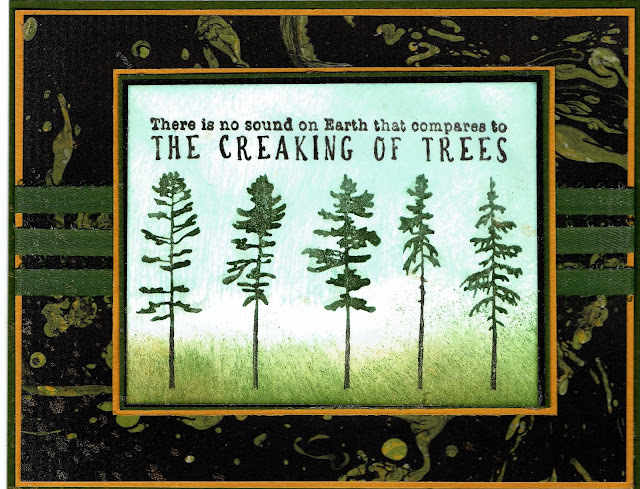 Then I punch a layer of gold text weight card stock, and a circle of the green color. It is popped up on the right side with dimensionals, and the left is only adhered with two sided tape. And a Merry Merry Christmas to You! A new month and new stamps are always exciting, but new Christmas stamps are very exciting! 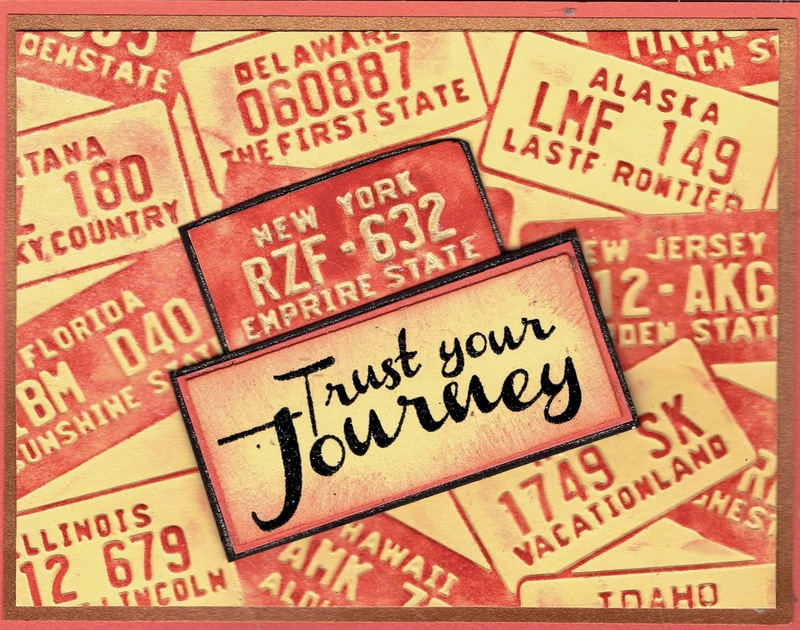 We are excited to share cards and projects with you using these new Technique Junkie stamps! 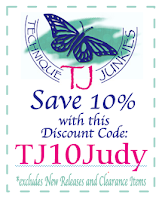 The entire Technique Junkie Design Team hopes you enjoy this release and will find some stamps you must have for your collection. Don't forget that all of the Technique Junkie Christmas release stamps are on sale for 15% off through October 10! Please start the Blog Hop with the Design Junkies blog -. - http://techniquejunkies.blogspot.com/ . 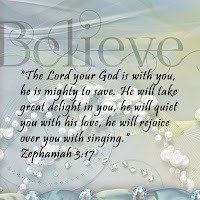 You may have come from the talented designer Pam DeChellis: http://journeyawakensthesoul.blogspot.com/. I totally understand the need for nice but simple cards for Christmas. I send out about 120 cards - all hand stamped! - every year. So my Christmas cards need to be relatively easy to make and yet look very nice. 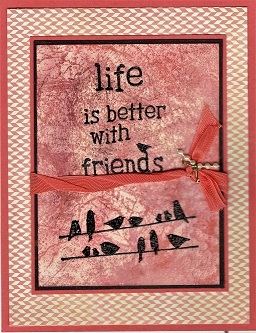 I will tell you these stamps can help you do exactly this! For this first card I sprayed several colors of Art Anthology Coloration sprays on white card stock. Then I inked up the Calm and Bright - http://techniquejunkies.com/calm-and-bright/ - image with black Memento ink and stamped it over the sprayed background. 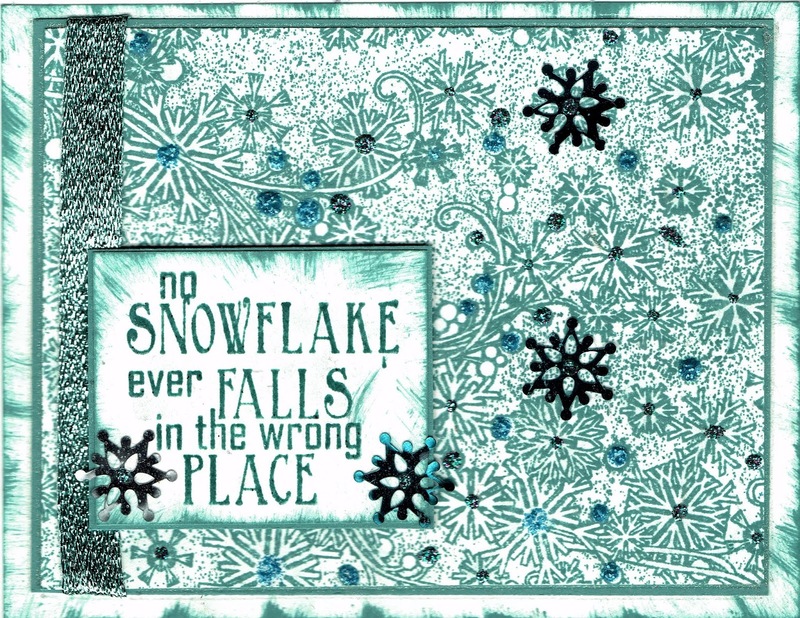 I used a Stardust glitter pen to highlight the snowflakes. I added the metal snowflake with a glue dot on the back. Lots of layers add to the visual interest. 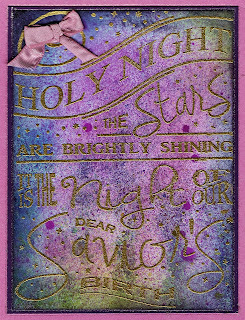 I also used a variety of Art Anthology Coloration sprays for the background and then I sponged some more light purple ink in the middle of the card stock before stamping the image for Technique Junkies Stars are Brightly Shining - http://techniquejunkies.com/stars-are-brightly-shining/. I inked up the stamp image with Versamark ink and covered it with detail gold embossing powder and heat set the powder. I tied a little bow and added it to the corner. Layers complete the card. I also used Art Anthology Coloration sprays to create the background for this card. 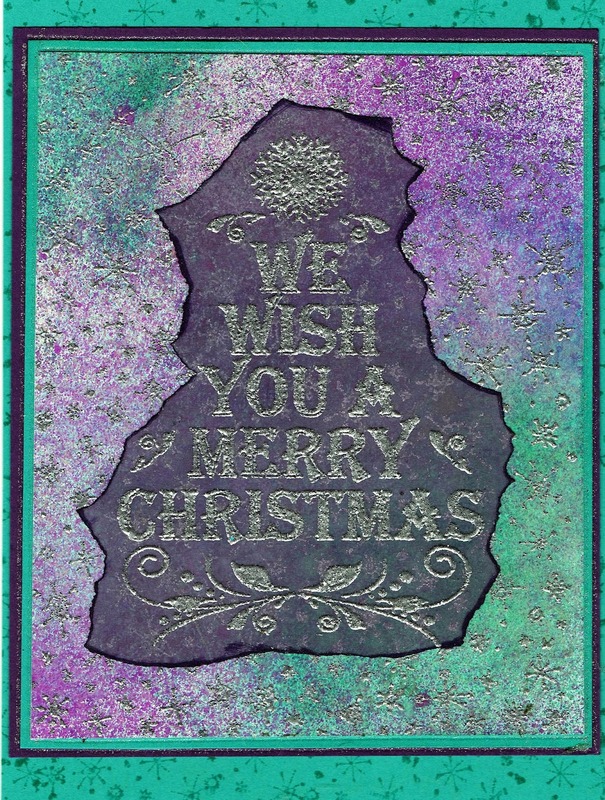 Then I stamped the new Technique Junkie stamp Merry Christmas Wishes - http://techniquejunkies.com/merry-christmas-wishes/ . I highlighted different areas with Smooch paints and glitter glue. I used an embossing folder and used Smooch paints on the embossed areas. 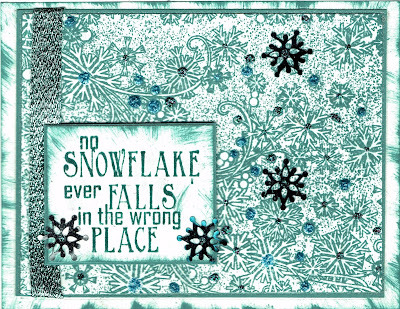 I used a Stardust glitter pen to accent the letters and the snowflake medallion at the top of the image. This fun stamp is just -- fun. Pat Huntoon has a real interest in giraffes -- thus we have this cute Technique Junkie stamp Safari Santa - http://techniquejunkies.com/safari-santa . I sprayed the white background with a beige Art Anthology Colorations spray, and then stamped the image inked up with black Memento ink. I used Prisma colored pencils with Gamsol (odorless mineral spirits) to color in the dear giraffe and Santa hat. I added some white or clear chunky glitter to the hat for interest. 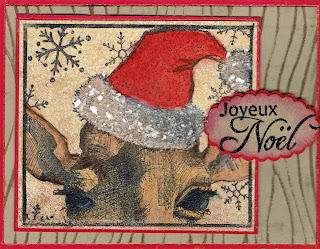 I stamped the greeting (Technique Junkie stamp Joyeux Noel - http://techniquejunkies.com/joyeux-noel/) with black Versafine ink and heat embossed with detail black embossing powder. I punched it out and also punched a red oval, cut it in half to layer behind the greeting. I layered the focal image with red card stock. I dry embossed some tan card stock and then highlighted the embossed lines with a brown ink pad. So there you have four fairly easy cards ready for mailing! 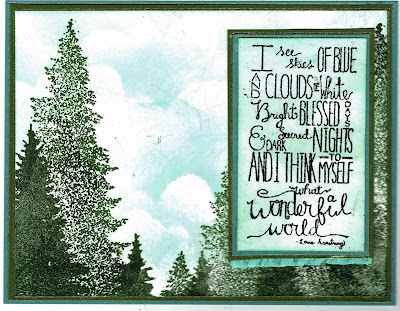 Your next stop on this blog hop is with talented Tonya Davidson: http://stampintonya.blogspot.com. Tonya Davidson: http://stampintonya.blogspot.com - please go here next. Please remember Pat has a 15% off on these newly released stamps through October 10th! Have a wonderful day, enjoy going stamp shopping -- and get inky!